About ten minutes after I posted this blog Valeant terminated its relationship with Philidor. The liability questions at the end of this post now have greater importance. I have left the post unchanged for that announcement. Enjoy. Forgive a long post. The Valeant/Philidor/US Attorney situation is complicated. The pattern of this post will be to state both what we know and how we know it - and to explore theories around the edge of that knowledge. Because the underlying situation is complicated the post will unfortunately be detailed and at some points non-committal. Almost anyone who has been following Wall Street will know that Valeant Pharmaceuticals, a large-cap and previously acquisitive pharmaceutical company, has been under pressure. They held a special conference call to answer concerns raised by Citron Research (a prominent individual short-seller), The Southern Investigative Research Foundation [SIRF] (see here and here), the Wall Street Journal (notably this article) and this blog. These articles focuss on a specialty pharmacy (Philidor) which distribute almost entirely Valeant products, have close interchange with Valeant staff, and is quite large (targeting 1000 staff by the end of this year). This was never disclosed by Valeant prior to the SIRF article. The main sources for these articles were two court cases in California where a Philidor associate, another specialty company called Isolani was suing R&O - a small specialty pharmacy company in California. The complete prior lack of disclosure about Philidor (which is clearly important to Valeant) allowed several wild theories to develop. Some of these theories (including theories I had) were wrong. Others are almost certainly correct. Some of these theories allege criminal activity by Philidor. Valeant has disclosed criminal investigations by two US Attorneys. If any of the criminal theories are correct it will be very bad for Philidor. Whether it is similarly bad for Valeant was one of the topics of the conference call and hence of this blog post. The most prominent allegation in the various articles came from Citron Research. That allegation - that the tied specialty pharmaceutical companies are being used for channel stuffing is almost certainly false. Valeant spent a disproportionate amount of time on this allegation - perhaps at the expense of ignoring the problems identified by SIFR, the WSJ and me. Whatever: let's take the conference call seriously. The more pertinent allegation is that Philidor is an artifice for defrauding insurance companies. This was inadequately addressed in the conference call. However it is the elephant in the room. Specialty pharmacies like Philidor are legal and several drug companies have them. Even if what Philidor did was illegal we are not responsible for them. Valeant argued they don't own them, don't appoint the CEO and are not in control. Besides Valeant are indemnified by them for any losses anyway. Even if there is a problem here Philidor is a low-single digit percentage share of our sales and hence it won't cause us much grief. 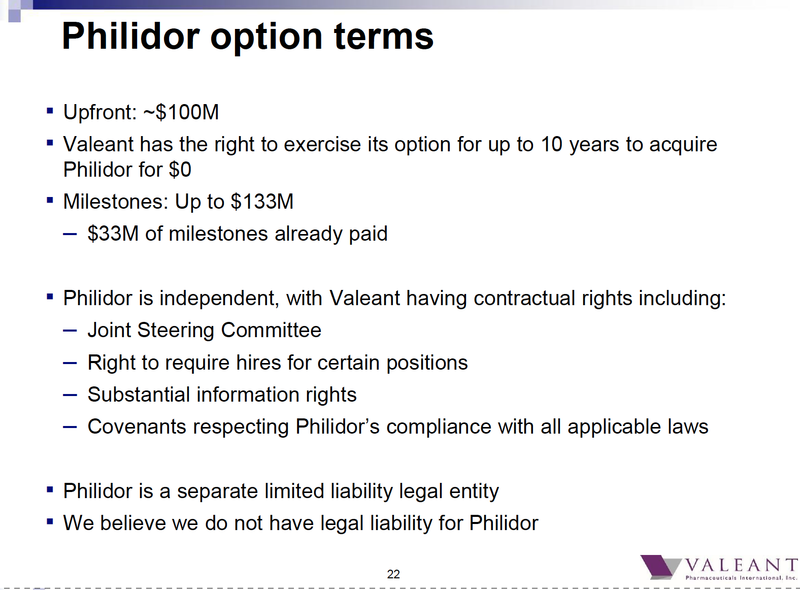 I think all stages of this defence are questionable: Philidor may well cause Valeant to collapse. Indeed I think that likely and my price target for Valeant is zero. At the peak the debt market is factoring in a default probability for Valeant of almost 50 percent in the next five years (link). They are I think underestimating the problems. Obviously the equity market has a very different idea. I am going to lay out the evidence in this post as we currently know it. Some of this comes from the work of Bronte and some is poached from other sources, including Roddy Boyd and SIRF, the WSJ, Propublica. In Part 1 I detail what is a specialty pharmacy and why both drug companies and customers and doctors might like them and insurance companies hate them. I also discuss the sort of infractions they might commit and the lines that separate criminal activity from merely aggressive business practice. In Part 2 I go through the evidence that Philidor might be on the wrong side of that line. In Part 3 I discuss the separation between Philidor and Valeant - a separation I believe is questionable. Some of the evidence comes from our own research, some from the call and some from some excellent work done by the WSJ. In Part 4 I detail the size of Valeant's non-traditional distribution models and how we might scale them. This produces data contrary to the data in the conference call. The scope of non traditional distribution at Valeant is much larger than bulls believe. In Part 5 I detail how Philidor may be used to fake Valeant's accounts. I don't think this is Philidor's main purpose but it clearly is an issue and Mike Pearson (Valeant's CEO) did not answer a very precise question on this in the conference call. After that there will be a brief summary. A specialty pharmacy is a pharmacy (usually but not necessarily) tied to a manufacturer which specialised in distributing classes of branded drugs. They are usually mail-order operations and operate over State lines. To operate they usually require a license in every State which they service. There are several features of these pharmacies which are are common to most but not all of these. Because they are captured by the branded drug distributors they are very loathe to suggest cheaper generics. A typical example is a Valeant product called Onexton - an acne cream. Onexton is a mix of two well known treatments for acne - clindamycin phosphate and benzoyl peroxide. Both these products are available as generics at low cost. However the combination has a price of $478 per tube. If you went to your local pharmacy they would (if they were competent and unbiased) suggest you buy the two generics. However if you go to the captive specialty pharmacy you will be sold the expensive drug (and the cost will largely be borne by your insurance company). Specialty pharmacies are often very willing to waive copays and other charges to sell the drug. To put it mildly Valeant would be more interested receiving hundreds of dollars a tube for Onexton than actually collecting the copay. This is not limited to Valeant. As a general rule specialty pharmacies are liked by patients and doctors. This is not surprising. If you want the active ingredients in Onexton you can buy the generics ($10-$15 each) and mix them and you will be out-of-pocket. Or you can go to Philidor, have them waive the copay and you will get them for nothing. And there is little to sort out. The specialty pharmacy covers the insurance claims. 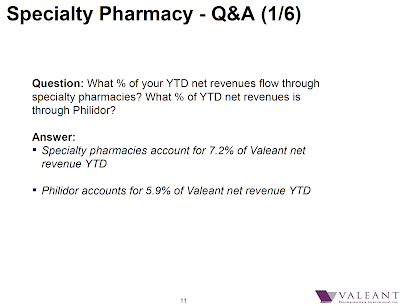 Valeant made a big deal of the quality of the service at the speciality pharmacies in their call. This is consistent with most (but not all) of the discussion on consumer chat boards. The problem of course is that insurance companies dislike specialty pharmacies. Again to go back to Onexton it is unlikely you could sustainably sell a combination of two generics at any price near $400 without insurance. A captive specialty pharmacy makes it easier to stick the bill to the insurance company. After all using two generics will have the same effect for very little money indeed. Specialty pharmacies are legal. Several drug companies (including most in the dermatology space) have close relationships with specialty pharmacy. They are darn useful in the case of difficult chronic diseases with cocktails of expensive drugs (such as HIV). A specialty pharmacy will know more about the cocktail of prescribed drugs and will get them couriered to you as needed. Alas specialty pharmacies are also the easiest way to get someone to pay $400 for your branded skin cream containing only generic ingredients. That someone is an insurance company and the product is a rip-off. Valeant spent considerable time in the conference call listing specialty pharmacies tied to other large pharmaceutical firms. They are legal. The most important thing a specialty pharmacy must not do is waive copays for Medicare, Medicaid or other government pharmaceutical insurance schemes. The government regards this as fraud against the government. One way of ensuring that everyone goes to prison is to systematically defraud Uncle Sam. I have no evidence that that is happening at Philidor/Valeant. Every Valeant copay assistance advert for instance specifically says that copay assistance is not available on Medicare or similar programs. This example for Onextin is instructive. It offers a zero copayment (and a coupon for your local pharmacy) but the coupon is not valid for Government programs. The government tends to be more forgiving of one-off instances of waiving copayments for Medicare. [Big fines but not prison.] Systematically defrauding the US Government is however unwise. One-off instances can happen accidentally: sometimes patients will misrepresent their own insurance position and sometimes processes to ensure no copayment waiver happens are slightly sloppy. Private insurers and the courts are not generally alarmed by occasional accommodations for individual patients with documented financial limitations. However, insurance carriers have successfully challenged the routine waiver of copayment obligations in the courts on numerous occasions. Courts dealing with challenges to discounts of copayment obligations have been concerned with two basic issues. First, a provider who discounts established fees for some patients but not others, without a valid distinction for the differing treatment, can be subject to claims of false billing by a party not receiving the discount or consideration, including claims by insurance carriers. Second, the routine waiver of patient copayment amounts can be viewed as breach of contract. Almost without exception, insurers impose a contractual duty on providers to make a reasonable effort to collect applicable copayment amounts from patients, and benefits are only available when the charge for the service submitted by the provider is the actual, and the usual, reasonable and customary charge (URC). The reasoning in these cases is that the uniform discounting or waiver of patients’ copayment portion of a provider’s fee evidences that the provider really only intends to collect that portion of the fee which is not discounted, making it improper to claim that the fee is the full undiscounted fee. There are other things that specialty pharmacies do that are illegal (even criminal). Perhaps the most notable is misrepresent diseases to insurance companies. To pick an example from another stock, Insys sells Subsys - a branded version of Fentanyl - a very strong narcotic. Fentanyl is approved for pain relief for some terminal cancer patients. Here is a court case where a registered nurse prescribed Fentanyl off-label (and her plea regarding narcotics distribution) but it is possible the attached speciality pharmacy (and not the doctor/nurse) falsely submitted claims to stating the patient had cancer when they did not. [Indeed this is what the prosecutor says in the plea arrangement.] Misrepresenting the script to the insurance companies is fraud and is criminal. In general misrepresenting the claim to a insurance company is fraud. However if you defraud an insurance company you may wind up in criminal court - or you could be lucky and only wind up in a civil court. Other things that a speciality pharmacy can do that are illegal is altering prescriptions so that cheaper generics can't be prescribed. If a doctor writes "dispense as written" on a script in most States it is illegal to dispense a medically identical generic. However if they do not write this the insurance company may insist on the generic. Given sales incentives (presumably with staff remunerated for getting payment from insurance companies) the incentive to write dispense as written onto scripts or to otherwise falsify doctor instructions is high. Warner Chilcott (a division of Allergan) was criminally convicted for (amongst other things) manipulating prior authorizations to induce insurance companies to pay for prescriptions of Atelvia. The fine however was not large ($125 million). Fines for infractions at specialty pharmacies are not uncommon. Generally you reward specialty pharmacies for getting the product out the door and reimbursed by insurance companies. To the extent that you use cash incentives for the speciality pharmacy for getting reimbursement the staff of the specialty pharmacy have an incentive to cheat. Whilst fines are common they are not usually ruinous. After all these are rarely systematic attempts at cheating insurance companies. A systematic attempt at cheating insurance companies will probably result in an enormous fine, criminal charges and executives in handcuffs. There were huge infractions at Arthrocare and the CEO went to prison - however they got the conviction on easier to prove channel stuffing allegations. The U.S. is seeking as much as $3.3 billion from Novartis AG in a suit claiming the company paid kickbacks to increase sales of two prescription drugs. The government claims a group of specialty pharmacies submitted thousands of fraud-tainted reimbursement claims to Medicare and Medicaid for the two drugs, Exjade and Myfortic. It’s seeking damages and civil fines against the drugmaker in a case set to be tried in New York in November. The U.S. disclosed the amount of its demand in a court filing Monday. The U.S. claims Novartis referred patients to the specialty pharmacies and paid kickbacks in the form of rebates to get the pharmacies to recommend the drugs to patients and to increase sales. The scheme violated the False Claims Act and Anti-Kickback Statute, according to the government. In this case it was a fully external speciality pharmacy owned by Express Scripts which did Novartis' dirty work. Express Scripts settled (for $60 million) and the fact that the false claims were submitted by a third party did not save Novartis. Novartis is almost certainly cooperating in this investigation and they recently raised reserves on the eventual fine (but to a number considerably lower than $3.3 billion). Specialty pharmacy (especially in dermatology) is often a device for getting overpriced drugs reimbursed by insurance companies. It may be legal or it may not be, depending on the practices of the pharmacy. But insurance companies fight back - especially if the pharmacy is particularly egregious. They either (a) stop paying or (b) pay an amount considerably lower than the list price of the drug. There is good reason. After all in some cases (such as Onexton) the cheaper combination is medically equivalent. And besides from the insurers point of view this is barely a customer service issue. Usually the insured has received their (overpriced) drugs from the specialty pharmacy already. There is some evidence (below) that insurers were rejecting claims from Philidor prior to the exposure by Roddy Boyd. After the Philidor scandal this will become more common and at the time of writing the wholesale rejection of claims processed by Philidor had begun. There is quite a lot of evidence that insurance companies are rejecting claims made by Philidor. Whether they are doing that legally or not or whether illegal actions by Philidor are prompting this rejection is not at first the issue. The issue simply is that they are rejecting payment. Anyway the various California lawsuits mentioned the use of the network of specialty pharmacies (including R&O) was to deal with insurance companies rejecting claims. The idea is that if the insurance company is wary of paying Philidor claims (say insisting on an audit of each claim) Philidor staff just use another pharmacists identification number. The insurance company may be much less likely to audit a claim made on say a retail pharmacy in California. This solution to insurance companies that were slow to pay claims was also discussed in a a recent (and fabulous) WSJ article. This relates to the period prior to the exposure of Philidor by Roddy Boyd and SIRF. Note there was a weighted price increase of 14 percent an an effective price increase of 1.7 percent. The most extreme example is Atralin where the price increase was 61 percent but they did not effectively get any increase. How is possible on average to get no increase in price having raised prices 61 percent? The answer I think is that insurance companies won't pay. And why is Atralin so extreme? Well it is a branded $604.81 small tube of Vitamin A cream. And that is it. Nobody in their right mind would buy it. It gets sold only because insurers pay - and having Philidor, a tied specialty pharmacy company - rather helps in getting this done. But Atralin is just an extreme version of the need for specialty pharmacy. Jublia is a marginally effective treatment for toenail fungus. Paint it on daily for 48 weeks and and your chance of having toenail fungus cured rises from 5 percent to 18 percent with some chance of an adverse reaction and a cost to insurance companies of more than $8000. Solodyn is a slow release minocycline for treating acne. There are generics available. Ziana is another combination of two generics. I could go on. This is not the collection of drugs a company gets from fantastic R&D. Indeed R&D has never been a major attraction of owning Valeant. Its a collection of drugs you get from fantastic - or maybe sneaky - marketing. And it is the list of products that absolutely require insurers to pay because well informed consumers generally would not. After the exposure of Philidor by SIRF, the WSJ, Propublica and this blog it was only a matter of time before insurers started rejecting claims more generally. As of writing both CVS and Express Scripts (amongst the biggest pharmaceutical benefits managers) have cut off Philidor. I have no evidence that Philidor systematically waives copays for Medicare or other government funded insurance. Looking at history, our commitment to patient assistant programs has grown at an annual compound rate of 128% from $53 million in 2012 to approximately $1 billion we expect to spend in 2016. This is appoximately 8% of all revenue. Copay waiving must be near ubiquitous. Since writing my first cryptic post I have received numerous stories of auto-ship refills with copayments waived. As explained above almost without exception, insurers impose a contractual duty on providers to make a reasonable effort to collect applicable copayment amounts from patients, and benefits are only available when the charge for the service submitted by the provider is the actual, and the usual, reasonable and customary charge. Philidor clearly does not do that. There is one place where we can unequivocally say that Philidor skates very close to the letter of the law. Philidor was denied a license to be a pharmacist in California. I rang Philidor, they answered Philidor and they stated explicitly on the phone that they service the whole USA. We understand that Philidor holds nonresident licenses in 45 states, the District of Columbia and its resident license in Pennsylvania. In the few states where it is not directly licensed, such as California, Philidor does not dispense products to patients. Philidor has agreements with affiliated pharmacies that have California licenses and those pharmacies have dispensed products to patients in California. We also learned that at least some of (and possibly all) of this "network of pharmacies" is owned through a variable interest entity [VIE] and that (until now) Philidor has not disclosed their ownership of them. The Valeant quote above indicates that these were used to get around California licensing. I suspect the California authorities will be interested in that. Propublica is already reporting concerns of Texas authorities in setting up a subsidiary pharmacy called Orbit. There is some pretty clear black-letter law in some States regarding this. Whether it is enough to sink Philidor is open to much doubt. However it will give insurance companies some grounds to sue for reimbursement or deny payment. I think the explanation that the "network" pharmacies exist to get around licensing restrictions (an explanation given by Valeant in the conference call) is bunk. I think the real explanation is much nastier. The latest WSJ article really is a stunner. Jonathan Rockoff (the journalist) has one of those wonderful definitive documents: he claims to have a Philidor training manual. I have not seen this manual and cannot judge first-hand what it contains. However - the evidence provided by the WSJ - and on the say-so of the WSJ - would be very useful in determining whether there was systematic fraud at Philidor. If this manual tells staff how to deceive insurance companies then its a slam-dunk for systematic fraud. Moreover this is all done across state lines using mail and wires. That would be a text book wire and mail fraud against a financial institution the penalty for which is up to $1 million per instance with no limit to the number of instances. So here is what Rockoff says (and they are his sources and I have not seen the said manual). If a health insurer wouldn’t work with Philidor Rx Services LLC, the pharmacy instructed staff to try again using the identification number of a partner pharmacy to secure payment. “We have a couple of different ‘back door’ approaches to receive payment from the insurance company,” a Philidor training manual said. This is a scorcher of an allegation. Philidor has acquired a network of pharmacies (mostly former mum-and-pop operations). The allegation here is that if the insurance company rejects the claim originally you should just "borrow" the identification number of a "partner pharmacy" and resubmit the claim. The money quote is "we have a couple of different ‘back door’ approaches to receive payment from the insurance company". Does "back door" mean deception? If so there is a very big problem for Philidor. Moreover the article from Jonathan Rockoff confirms work done by Bronte and The Skeptic. The Skeptic's take is better than mine. We know the UPS delivery details of 21,000 prescriptions administered by Philidor but marked using R&O's pharmacy identification number. These were not just shipped to California (as asserted by Mike Pearson in the conference call) but were shipped all over the USA and to states where neither Philidor nor R&O were licensed. The Skeptic has an analysis of all 21,000 prescriptions stripping data from UPS's website. Using R&O's number to ship to states where Philidor was licensed but R&O was not looks like Philidor was shopping for a Pharmacist's number that did not prompt rejection from the insurance companies This is the allegation in the WSJ. Deceiving an insurance company as to who filled the prescription also looks like it matches the definition of mail fraud. It is an artifice to obtain money from a financial institution using mail over State lines. Philidor pretended the script came from R&O whereas it really came from Philidor. Whatever: if the prosecutors wish to take this seriously (and I suspect they will) this is enough to kill Philidor. Whether it is enough to bankrupt Valeant will depend on whether Valeant can successfully defend the notion from the conference call that it is not liable for Philidor misdeeds. I don't think they can - but that is discussed below. The Wall Street Journal hints at other misdeeds by Philidor. A separate department at Philidor would seek insurance coverage. If the insurer asked a doctor to explain why the patient needed a costlier Valeant drug rather than a less-expensive alternative, Philidor employees would sometimes fill out the paperwork for the doctor, two of the employees said. The WSJ leaves it as ambiguous as to whether this has been done with or without approval from the doctor. With approval from the doctor is legal. Without about approval from the doctor it is criminal and that behaviour has been prosecuted in the past. A specialty pharmacy that fills prescriptions for Valeant Pharmaceuticals International Inc. has altered doctors’ orders to wring more reimbursements out of insurers, according to former employees and an internal document. Workers at the mail-order pharmacy, Philidor RX Services LLC, were given written instructions to change codes on prescriptions in some cases so it would appear that physicians required or patients desired Valeant’s brand-name drugs -- not less expensive generic versions -- be dispensed, the former employees said. Typically, pharmacists will sell a generic version if not precisely told to do otherwise by a “dispense as written” indication on a script. The more "dispense as written" orders, the more sales for the brand-name drugmaker. An undated Philidor document obtained by Bloomberg provides a step-by-step guide on how to proceed when a prescription for Valeant dermatological creams and gels including Retin-A Micro and Vanos is rejected. Similar instructions for changing the DAW indication are supplied for patients who are paying in cash. I have not seen the training manual but if this training manual exists it is evidence of systematic fraud against insurance companies. Valeant went to an unusual extent to hide their relationship with Philidor. Philidor was first exposed publicly by the Southern Investigative Reporting Foundation. At this point Philidor was growing enormously fast (rising to about 1000 staff by this year end). Philidor however had a website registered to domains by proxy and no information as to ownership on Valeant's website or in any SEC filing. Moreover the California government went as far as alleging that Philidor had given false statements under penalty of perjury - seemingly to hide their ownership. The headline from the call was that terms of the options involved and whether they do or don't "own" Philidor. If you want a quirky take on it Matt Levine is clever as usual. But in the presentation we discovered deniability had been built into the Philidor arrangements from inception. Valeant says that they paid $100 million up front for an option to acquire Philidor at no consideration any time in the next ten years. They also are liable for milestone payments of up to $133 million. Remarkably many accepted this rhetorical stunt. In terms of the zero dollar option value, I think it is legal and maybe it's unusual. Mike Pearson thinks it is legal and knows it is unusual. Just wanted to follow-up on the Jublia question. You mentioned the change in the gross to nets, but did the -- especially, did the number of scrips going through the specialty pharmacy improve? I think it was about 50% last time. Secondly, given the strength in some of your other derm products, Onexton and Luzu, what percent of those scrips are through your specialty pharmacy channels? Yes, the adoption through multiple specialty pharmacies continues. I think last time we said Jublia was around 50%. That trend continues. For derm overall, it varies by product, but it's around 40%. And here we discovered that that for dermatology products specialty pharmacies were very important and the analyst thought that it was likely to be particularly important for Onexton and Luzu. We saw above why it would be particularly important with Onexton. Luzu like Onexton also has generic alternatives and would require insurance to get people to pay the high sticker price. Even when asked directly Valeant did not reveal it "owned" its main specialty pharmacy. 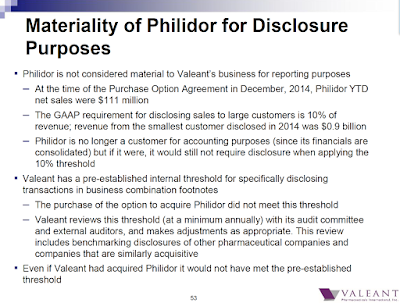 Did Valeant need to disclose the ownership of Philidor and why did they hide it so thoroughly? The short answer is Valeant probably didn't need to disclose Philidor but that hiding it was unusual. Here is the critical slide. The observation was that Philidor - a $100 million option with cumulative net-sales was not material and therefore did not need to be disclosed. Moreover the list of subsidiaries Valeant has goes to subsidiaries much smaller than Philidor. For instance the attached list from the 10-K has tiny little subsidiaries - multiple subsidiaries - each with one corporate jet. But it does not mention Philidor. Philidor also met the definition of a subsidiary within Valeant's bank covenants - but I am not sure whether this obliged them to disclose them in SEC filings or only to the banks. Hiding Philidor made me think prima-facie the company is doing something wrong at Philidor. The company has an alternative explanation: they hid it because it was a competitive advantage. Notwithstanding this Valeant has gone to lengths to legally distance itself from Philidor suggesting that they were aware there was a possibility that they were doing something wrong. able to walk away entirely. Both those assertions are questionable. But these suggestions make it clear they were aware of the possibility of legal problems. Whilst Valeant has made a great deal of effort to legally separate itself from Philidor there are plenty of circumstances where such a separation will not stick. Above I mentioned a case where Novartis is facing criminal charges (and a $3.3 billion fine) because of actions by its specialty pharmacy. In this case the specialty pharmacy is owned by Express Scripts. It is clearly legally separate. The reason that Novartis is (potentially) liable for the actions of Express Scripts is that the incentives that Novartis gave Express Script induced the fraud and they were either reckless or knowing as to this inducement. The issue is simple: was Valeant or senior members of staff complicit in crimes at Philidor? If so then nothing much will save Valeant. Around the Phoenix-area offices of mail-order pharmacy Philidor Rx Services LLC, employees said they often ran into a friendly colleague named Bijal Patel who tracked prescriptions. But when the employees got an email from the colleague, they say he used a different name: Peter Parker, the alter ego of Spider-Man. He was among a few workers at Philidor offices who went by one name in person and another in emails during the past two years, according to three former employees. Mr. Patel and the other people weren’t employed by Philidor, though the emails used a Philidor address, these people said. They were employees of drug company Valeant Pharmaceuticals International Inc.
As late as Sunday afternoon, the LinkedIn page for a man named Bijal Patel identified him as manager of access solutions at Valeant in Scottsdale, Ariz. Mr. Patel didn’t respond to requests for comment. Bluntly senior employees of Philidor were in fact Valeant employees but were obscuring that tie by using the names of Peter Parker and other super-heroes. The Valeant employees (plural) set up "structures and processes". This is going to be impossible to keep separate. Further we know that Valeant rewarded its own staff for helping Philidor. Here is a corporate award to a Valeant sales staff member who "helped set up Philidor in six States". This is consistent with the WSJ article that Valeant employees were involved in setting up Philidor. The specialty pharmacy channel is very important in dermatology in America. Above I quoted the second quarter conference call where they put the specialty pharmacy channel (including but not limited to Philidor) at 40 percent of sales and 50 percent of Jublia sales. 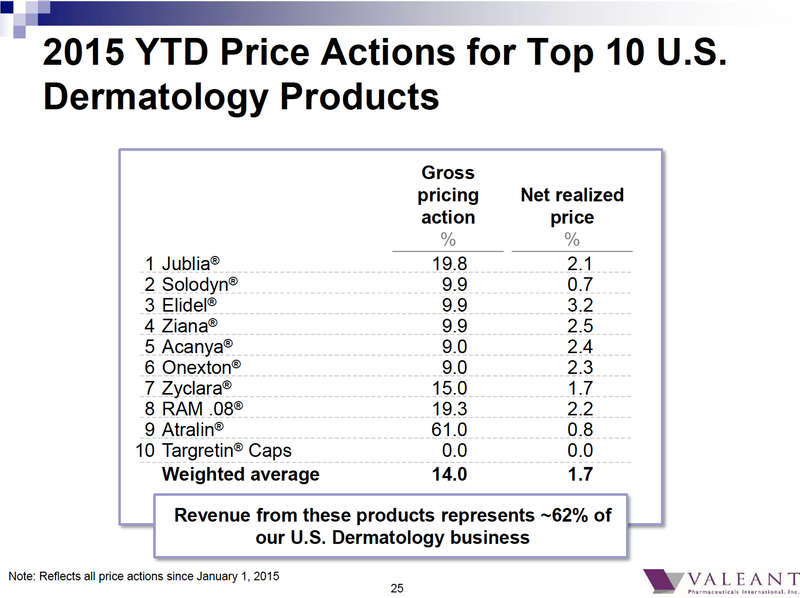 To regular Valeant watchers this slide came as a shock. It downplayed the importance of Valeant's alternative distribution channels. Only a year ago Valeant was telling us how big and important their alternative distribution was. If you remember Valeant was having the huge spat with Allergan. Allergan were saying Valeant's sales were falling and Valeant was saying that they were growing. Allergan was using IMS data which is a standard data source in pharmaceuticals. Valeant stated outright that their sales were not falling and that the IMS data did not cover the bulk of their sales due to reliance on channels such as specialty pharmacy. This critical text is here (and the source is here). 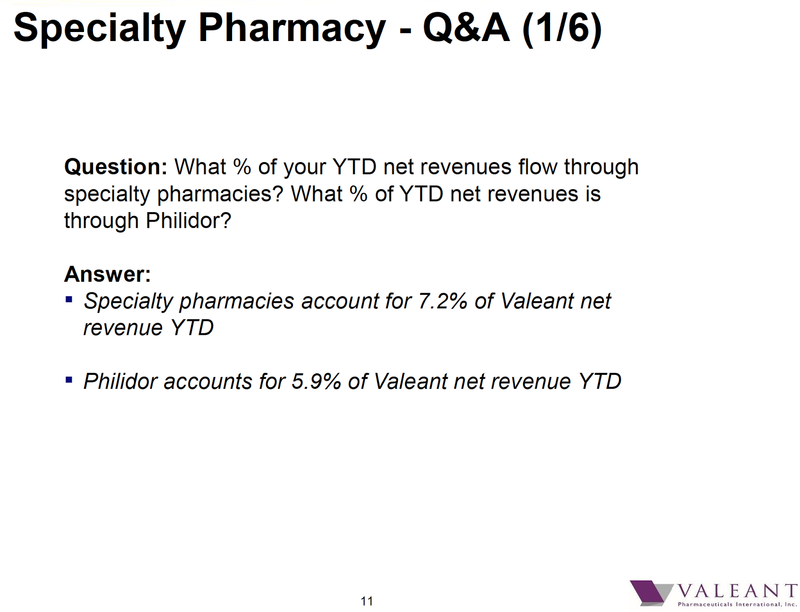 Now these slides were made when Philidor was much smaller than its current size and even then more than 100 percent of the growth of many of the business lines of Valeant came from specialty pharmacy and other non-traditional distribution channels. Net of non-traditional channels Valeant's sales were falling (Allergan was not misrepresenting the IMS data). Inclusive of non-traditional channels Valeant claimed their sales were rising. One observation that had me wondering was the changing scope of Philidor between the 3Q conference call and the special conference call. Philidor, one of our specialty pharmacy partners, provides prescription services to patients across the country, and provides administrative services for our copay cards and is a dispensary that fills prescriptions. We have a contractual relationship with Philidor, and late last year we purchased an option to acquire Philidor if we so choose. Specifically Philidor is one of several specialty pharmacy partners [which fits with observations above], dispensed scripts across the country [for which we know it is not licensed] and "provides administrative services for our copay cards". 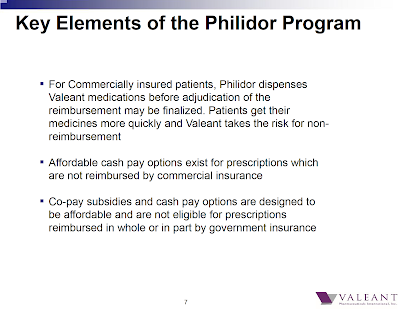 At no point does it say that Philidor administers Valeant's copay cards. Maybe the first conference call misspoke - but administration of the copay card is a core function. Moreover the copay card program is critical to Valeant's relationship with other specialty pharmacies. If Philidor acts abusively then the entire non-traditional channel for Valeant is probably tainted. I would really like to understand whether Philidor really does administer Valeant's copay system generally (and how that is run) or whether Mike Pearson misspoke in the 3Q conference call. Since Philidor is consolidated into Valeant it cannot be used to fake Valeant's accounts by channel stuffing. Citron's core allegation is incorrect. However there are other things that can be done. As stated above Valeant is liable for up to $133 million of "milestone" payments (presumably if Philidor meets sales targets". These milestone payments would of course be capitalised into the cost of buying Philidor - but you could alternatively describe them as "sales support expense" in which case they should be deducted in the P&L statement. Yes. Thank you very much for taking a fixed income question. In terms of who received the money for the $100 million up front plus the first milestone payment, my understanding is that there are a number of equity owners. I think it's between 10 and 20, maybe more. And they would be whoever owns the equity of Philidor would've received the money. And whether those individuals decided to contribute money into the operation I have no clue. I just know that we have not contributed any money into the operation. In terms of the zero dollar option value, I think it is legal and maybe it's unusual. The answer to the question was "I don't have a clue". Now we know (from above) that Valeant provided support for establishing Philidor and that several Valeant staff work at Philidor (using names borrowed from comic books). But Valeant paid $100 million for what was essentially a startup they founded. And they pay progress payments too. If that is a capital expenditure it is a bizarre one. Valeant provided critical support for setting it up and after doing that they buy it. The alternative in part is the $100 million was used to run Philidor and the $133 million of milestone payments also cover Philidor expense. But in that case they should be expensed. I guess this is something for the Ad Hoc Committee of the board to work out. Philidor can't be used for channel stuffing now but it could be used for channel stuffing before acquisition. If it had been used for channel stuffing before acquisition then pre-acquisition Philidor would have owed a great deal of money (for inventory) to Valeant. When it was acquired that internal loan would be cancelled and the consideration would have been added to goodwill. That is a wonderful fraud and is in fact how Lernout & Hauspie (a very famous fraud) faked its accounts. Essentially fake earnings from stuffing Philidor would be turned into fake receivables - and then the receivables will be cancelled and turned into (unauditable) goodwill. I hope the accountants have covered base for this possibility. The tell in the accounts would be a strange drop in receivables at the end of the 4Q of 2014. Alas Philidor was small relative to Valeant (then) and so it is not certain that this change would happen. The evidence is against Valeant having committed this fraud. The trade receivables rose between 3Q and 4Q 2014. Citron's report into Valeant was easy to dismiss. Citron argued that Valeant used the undisclosed relationship with Philidor to goose the accounts through channel stuffing. 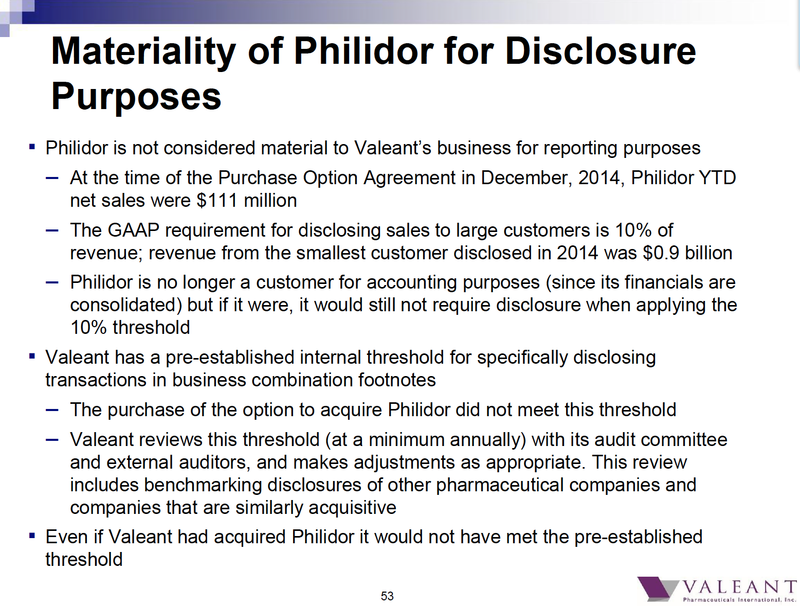 Valeant did a good job dismissing that though in the conclusion we learn there are some minor accounting issues with Philidor. (c). Whether this is big enough in Valeant to cause very adverse impacts on Valeant equity and debt holders. The evidence is very strong for (a) and most the evidence has been provided by the Wall Street Journal. Insurance companies are taking no chances: several big companies are now no longer reimbursing claims submitted by Philidor. It is very unlikely that the separation between Philidor and Valeant (as per question (b)) is sufficient to protect Valeant from liability. They appear to be joined at the hip with Valeant providing senior staff (who work under false names) and Valeant providing much advice when establishing Philidor. Whether the Philidor problems are sufficient to cause major pain to shareholders (even bankruptcy) is unclear. 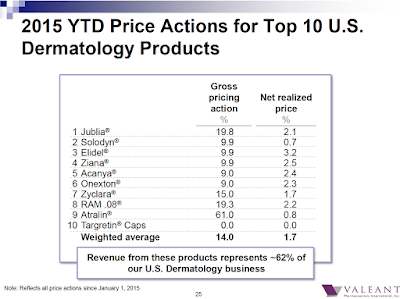 Philidor itself is a high single-digit percentage of Valeant's sales (but it critical to the dermatology franchise). 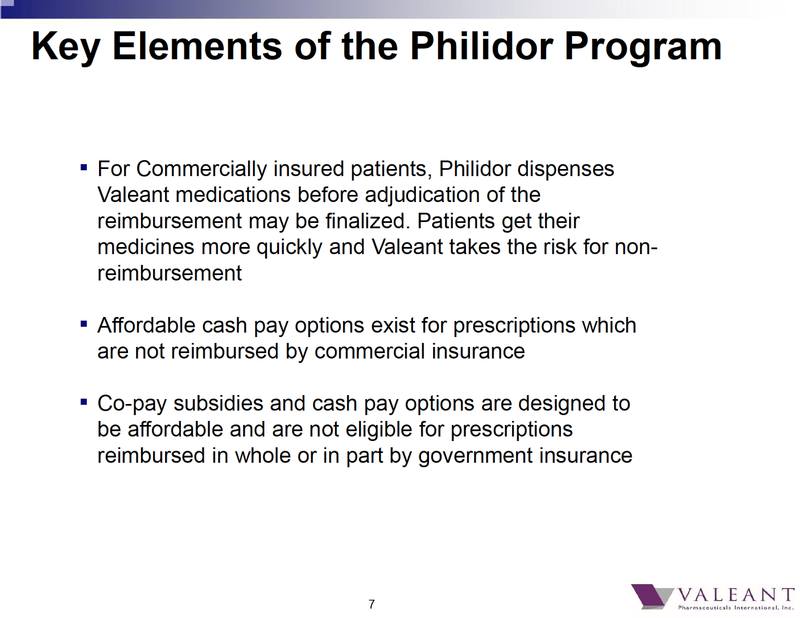 However Phildor also may administer the copay cards and they are critical to quite a lot of Valeant's business. Non traditional distribution is the difference between a shrinking Valeant (as per the IMS data) and Valeants assertion that it is growing. I am intrigued as to how this plays out. The Wall Street Journal has a fabulous article about Valeant's ties to Philidor - its captive specialty pharmacy. 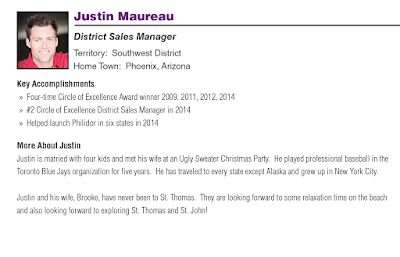 In it they suggest that Valeant staff double under fake names as Philidor staff. The use of alternative names by workers at Philidor is one of a number of new details emerging about the relationship between Valeant and the network of specialty pharmacies it uses to distribute drugs. The relationship is at the center of questions that investors have raised about the strength of the drug company’s operations and the disclosures of its business ties. Citron Research alleged that Philidor was used as a method of channel stuffing. However I think that it is more likely that it is used as a mechanism for customers to buy and insurance companies to pay for drugs that they would not have otherwise done so. Two methods are - it seems - used to do this. One has been widely discussed - copay assistance. The other is using name of a pharmacist that is seemingly unrelated (or at least where the relationship has not been disclosed) to "fill" the prescription. That pharmacist essentially donates or lends their NPI number. The captive pharmacies are variable interest entities because they are controlled but not owned. Valeant would in this case wish to hide their ownership. There is a court case between Isolini (almost certainly an undisclosed Philidor and hence Valeant subsidiary) and R&O pharma (a pharmacy with a license in California). You can find the Isolini documents here (warning large folder). The usual explanation for why Philidor wanted to use R&O pharma was that Philidor had been denied a license to operate in California and R&O had such a license. We however have our doubts. One of the Isolini documents (provided by the Philidor/Valeant side of the transaction) had an invoice for all the product that had been shipped in R&Os name and for which R&O owed money. That list contained identification numbers. We discovered that those numbers were in fact UPS shipping numbers and each of these deliveries is traceable. This (linked) document is a list of UPS tracking numbers. And those deliveries went all over the United States. They went to California - sure - but they also went to other addresses. Some went to States where Philidor was licensed but not R&O. Some went to States where R&O was licensed but not Philidor. Some went to States like Oregon where neither R&O nor Philidor was licensed. So here is the pertinent question: why would Philidor (which is staffed by Valeant staffers using false names) use the name of a two-bit pharmacy to send prescriptions all over the United States including to States where the two-bit pharmacy was not licensed? The only explanation I can come up with - and one that the company should address in the conference call - is that they did it because they were getting rejections or audits from insurance payers when using Philidor's name. Hence they used the NPI number of another pharmacy and the payers paid without audit. I expect the company to provide an alternative explanation in the conference call because this looks like deception using a mail service to deprive property from a financial institution: classic mail fraud. And because it is against an insurance company (a finacial institution) the monetary penalty is up to $1 million per instance. And each instance is separate and fines are cumulative. Don't even try to work out the fine. PS. These conclusions are broadly similar to Roddy Boyd's most recent article (which is excellent). For reference here are the first hundred or so of many UPS numbers - used the linked document to see them all. Is a pharmaceutical manufacturer allowed to own or effectively control a pharmacy in your home state? If a third party obtains effective control over a pharmacy licensed in your state, is a new registration filing required? If a pharmacy owner sells all or a portion of its economic interest in a pharmacy in your state, is it required to update its registration? Is it a violation of state law in your state to fail to disclose the ultimate holder of control and/or economic interest in a pharmacy? That is, if Valeant exercises control or holds an economic interest in Philidor, and Philidor is a regulated owner of a Pharmacy, has Philidor violated your state registration laws by failing to mention the ownership and/or control of Philidor by Valeant? May two pharmacies “share” a National Provider Identifier when dispensing medications in your state, as it has been alleged R&O and Philidor have done? Does the law in your state allow a pharmacy to seek reimbursement for prescriptions filled from government or private payers using an identifier such as an NPI#, NDPCP#, or NABP# not assigned to it? If not, what potential legal consequences and penalties would attach? For the California Attorney General: as Philidor Rx Services LLC is not licensed as a mail-order pharmacy, is it allowed to purchase directly or indirectly, the equity of or an option to purchase the equity of a pharmacy (R&O) that is registered in California? For the California Attorney General: if we interpose another entity into the prior question—Valeant owns and controls part of Philidor that owns and controls part of Isolani that owns and controls part of R&O Pharmacy—has R&O complied with California licensing and disclosure laws, on penalty of perjury? For the Pennsylvania Attorney General: as Isolani LLC is not registered as a foreign corporation in your state but owns an interest in a pharmacy (R&O) that is registered in Pennsylvania, how is it able to operate based in Hatboro, PA? May two pharmacies “share” a National Provider Identifier when introducing medications into interstate commerce, using the telephone and mail, as Philidor and R&O are alleged to have done? Does federal law allow a pharmacy to seek reimbursement for prescriptions filled from government or private payers using an identifier such as an NPI#, NDPCP#, or NABP# not assigned to it? If not, what potential legal consequences and penalties would attach? It has been alleged in documents filed with the court in a lawsuit by Isolani against R&O Pharmacy that Philidor encouraged the owner of R&O to falsely certify the results of a prescription audit by one of its payer clients. It has also been alleged that Philidor used identifiers (such as NPI#, NCPDP#, and NABP#) belonging to other pharmacies to send invoices to payers for prescriptions filled. Will you investigate whether the actions of Philidor Rx Services to constitutes “health care fraud” under 18 USC § 1347, which applies to public and private providers of health benefits and does not require actual knowledge or specific intent? Similarly, if proven, will you investigate what is alleged to be a specific intent to deceive payers in this way could potentially constitute mail or wire fraud, as defined in the federal statutes? What steps are pharmaceutical manufacturers and/or their wholly-or-partially owned pharmacies required to take to ensure that persons eligible for government-paid prescriptions are not offered waivers, coupons, or charity assistance, in whole or in part, for prescription co-payments? Will you investigate whether such steps have been taken by Philidor and its affiliate pharmacies? Will your staff investigate and will you convene a hearing of the Senate’s Permanent Subcommittee on Investigations to discuss these issues and others related to Valeant's business practices and their compliance with state and federal laws? Will you continue to accept claims for payment from Philidor Rx Services LLC, R&O Pharmacy, West Wilshire Pharmacy, Safe Rx Pharmacy, Orbit Pharmacy? Will you undertake an audit (or re-open past audits) of these pharmacies to determine their continued eligibility to seek reimbursement from you for prescriptions dispensed? Will drugs manufactured or marketed by Valeant in the future require more stringent pre-clearances or other restrictions? Are there any other entities with whom Valeant has relationships like Philidor Rx Services LLC or its affiliates that haven’t been disclosed yet? Are there any other entities for which Valeant holds an option to acquire ownership that have not yet been disclosed? What portion of these annual amounts does Philidor administer? What instructions have you given Philidor in administering these programs? What criteria have you instructed Philidor to use in determining patient eligibility for these programs? How do you monitor Philidor and other entities to ensure that patients meet the criteria you have established? How do you reward (or punish) Philidor and other entities for adhering (or not) to these criteria? What controls do you have in place to ensure that Philidor administers these programs legally? Systematically waiving co-pays for claims that would otherwise be paid by Medicare or other government programs is illegal. Have you ever, prior to the arrival of subpoenas from US Attorneys, disciplined Philidor or withheld or otherwise delayed payment because individual staff of Philidor have broken these laws? If so, what actions were taken? In what amounts, when and why? How have you ensured that any such problem has not recurred and will not do so again in the future? How many Valeant employees, contractors, or agents (whether full or part-time) are responsible, in whole or in part, for monitoring Philidor’s compliance with your guidelines and state and federal law? How often do you and your executive team review Philidor’s adherence to your guidelines and to state and federal law regarding co-pay assistance? How is Philidor compensated for operating this program on your behalf? Is any portion of their compensation based on prescription volume dispensed or revenue generated? In the conference call Mr. Pearson stated that Valeant funds multiple outside foundations that have multiple donors. What are the names and locations of these foundations and what portion of its operating revenue do Valeant donations represent? Who are the five largest donors to each? Presumably these foundations fund copays for medicare and other government sponsored pharmaceutical insurance. Which outside institutions? How much money? How are these donations accounted for in your GAAP accounts? Where do these donations appear in your audited financials reported on form 10-K? How do you determine the amount of assistance to provide each year? How did you select the $1B projected total for 2016? How do you assess whether you are getting value for money for your charitable deductions? What controls do you maintain to ensure that shareholders receive value for the $1B in contributions? Have your auditors inspected those controls? Who (which individual or group of individuals) determines which patients will receive co-pay assistance, and for which products? Are the individuals making such award determinations employees of Valeant, Philidor, or a third party? (If a third party, who?) How are these individuals compensated? Of the billion dollars of patient assistance expense that you expect in 2016 how much is administered through Philidor and how much is through other parties? Who are the other parties and for what amounts of this expenditure do you expect each will be responsible? Can you provide a detailed breakdown of patient assistance costs by product or business line? How much for instance is neurology, dermatology, ophthalmology, etc.? It is our impression that Philidor is heavily focussed on dermatology. Is that correct? If so, who administers the patient assistance outside dermatology and how do you control them? What proportion of your dermatology products are sold with patient assistance? What proportion of your products (in dermatology or not) are sold to government-insured patients? What proportion of your products (in dermatology or not) are sold to government-insured patients with patient assistance programs? How is it the case that Philidor administers your co-pay assistance programs, yet you indicated that Philidor is responsible for only certain of your products, most of which are dermatological in nature? You indicate that the form of assistance ranges from capped co-pays to subsidized prescriptions to referrals to a foundation (for patients in federal programs) to which you contribute. What was the total amount of assistance awarded for each category? Which foundations received such grants from Valeant, and in what amounts, over the past three years? How much did each of those foundations dispense as part of the assistance programs for drugs produced and or marketed by Valeant? What portion of each charity’s total funding does Valeant represent in each case? What portion of this and prior years’ “patient assistance” programs funding was used to reimburse prescriptions filled by Philidor or other affiliated pharmacies? What portion went to non-Valeant affiliated “specialty pharmacies?” What portion went to non-Valeant affiliated “traditional” pharmacies? For each of the products that you indicate is covered by your patient assistance programs, how much assistance has been provided for each, in what form, and by whom? How do you ensure that patients who receive a reduced co-payment, in whole or in part, do not subsequently submit reimbursement requests to government-paid programs for which they may be eligible? Before you received the subpoenas from two US Attorneys had you been having ongoing dialogue with them or did the subpoenas come entirely by surprise? I know that you are not disclosing the detailed questions in these subpoenas but can you answer one question: in aggregate, how long are these document requests by number of pages? Are they five pages, fifty pages or five hundred pages? Do you know if any of your independent administrators of your patient assistance programs have received subpoenas? Has Philidor (or any of its affiliates) received subpoenas? How is Philidor compensated for the services it provides to you? Is any part of Philidor’s compensation based on the volume of prescriptions filled, revenues or co-pay assistance (of any type) awarded? You have stated that Philidor will dispense a drug in advance of an insurer’s commitment to reimburse you for the cost of that drug, and that Valeant thus bears the risk that the insurer billed by Philidor will not pay. If a co-pay is waived, diminished via a coupon, or paid in whole or in part by a charity, how do you ensure that prescriptions filled by Philidor will ultimately be approved by the insurance company? Are Philidor employees given any sort of incentive to ensure that the prescriptions are indeed reimbursable? What portion of insurance claims submitted by Philidor over the past several quarters were disputed or went unpaid? To your knowledge, has Philidor ever failed an audit by a payer? If so, who, when, and why? How often do senior staff members of Valeant meet with senior staff of Philidor? Will Valeant file copies of its contracts and agreements with Philidor Rx Services LLC, its owners/members, and its affiliates with the Securities and Exchange Commission? Do any Valeant employees, contractors or agents presently work full- or part-time in any Philidor office? Have they previously? Has any employee of Philidor been instructed to deny or otherwise obfuscate the relationship between Valeant and Philidor? Has any Valeant employee, contractor, or agent so instructed any employee or member of Philidor? In your relationship with Philidor, past and present, what was and what is the role of Gary Tanner? Will the Board of Directors capable law firm/forensic accounting firm be hired to independently assess the situation? When? When were members of the Board of Directors first informed of your commercial, operational, and/or financial relationship with Philidor, its owners, or its employees? What were they told? What such information have they been provided since? When were your auditors, PriceWaterhouseCoopers LLP, first informed of your commercial, operational, and/or financial relationship with Philidor, its owners, or its employees? What were they told? What such information have they been provided since? Had it not been for press reports regarding the relationship with Philidor, the lawsuits between you and R&O, and the lawsuit between Isolani LLC and Russell Reitz, what plans did you have to disclose your relationship with Philidor and R&O? If you had no plans, why not? There are reports online of doctors suggesting that their patients fill prescriptions at Philidor to save money on co-payments. How do doctors know about Philidor? Do you or your salespeople inform them? If not, how are the doctors finding out about Philidor? Are your sales representatives aware of your relationship with Philidor? When were they so informed? Was Philidor or its affiliates mentioned as part of your representative training? Are your sales representatives instructed to or in any way compensated for informing the prescribers they visit of Philidor’s existence or its ability to waive or diminish, in whole or in part, co-payments for products produced or marketed by Valeant? Do your sales reps carry literature of any kind that mentions Philidor? How does Philidor compensate Valeant for such referrals, if any? Alternatively, how are patients made aware of Philidor’s existence? If it is by prescribers, why? Are any incentives or materials provided by Valeant or Philidor or its employees or contractors to make patients aware of such pharmacies’ existence? What is the total amount of revenue from Philidor that is consolidated on your financial statements that is derived from cash co-payments Philidor received for prescriptions it filled? You stated on your 3Q2015 conference call that “[Philidor] does not restrict prescriptions it fills to any particular manufacturer.” What portion of Philidor’s revenue that is consolidated on your financial statements is from sales of non-Valeant products? What portion of prescriptions filled by Philidor are for non-branded generics? What portion of total prescriptions filled with non-branded generics were written on the prescription and what portion were requested by the patient? If a patient does not request a generic but a non-branded generic is available, will the Philidor pharmacist suggest such a generic? To your knowledge has Philidor or Philidor staff ever written a dispense as written code on the script without being specifically directed to by the doctor or the patient? To your knowledge, are pharmacists at Philidor pharmacies allowed to suggest generic alternatives when available? If not, why not? Who gave the pharmacists you employ such direction? And if not, what gives you legal comfort that the states in which Philidor is licensed allow a non-pharmacist to give such instruction to a pharmacist? Have Valeant officers or employees, whether full or part-time and present or former, given any direction to pharmacists employed, whether current or former, full or part-time, as to whether to suggest substitution of generic drugs? To your knowledge, have officers or senior staff at Philidor or its affiliates so instructed the licensed pharmacists they employ? What portion of the revenue from Philidor that you consolidate on your financial statements is derived from products not produced or marketed by Valeant? What portion of such revenue is for generic substitutes for prescriptions written for brand-name products, and for which products? In its rejected filing in California, Philidor indicated that its upstream wholesale supplier was Kinray, a division of Cardinal Health. To your knowledge, is that correct? To your knowledge, has Philidor purchased your products from any other wholesalers? If so, whom? Do you now, or have you previously, shipped products produced or marketed by Valeant directly to Philidor? Do you include inventory held at Kinray or any other wholesaler used by Philidor or its affiliates as part of the consolidated inventory of Philidor held on your balance sheet? Were you aware that Philidor’s application for licensure as a mail-order pharmacy had been rejected by the state of California? How were you so informed and when? What actions did you take or communications did you have with your employees, the management, or the owners of Philidor, if any, upon learning that information? To your knowledge, did Philidor ship any prescriptions to consumers in California or other states in which it was not licensed? If so, when were you so informed? What corrective action did you suggest if any? If not, what impact did Philidor’s inability to legally fill prescriptions in California have on its relationship with you and/or the entries consolidated on your financial statements? What steps did you take, if any, to ensure that Philidor was licensed in each of the states to which it shipped prescriptions for your products? Before you acquired an option to purchase Philidor, did your employees or agents perform any sort of audit or inspection of Philidor’s state licensing status? Did they inquire as to whether Philidor had ever had a license denied or revoked, or if Philidor had improperly shipped product to states in which it was not licensed? Were any Valeant officers, employees, agents, or contractors aware, as Philidor CEO Andy Davenport indicated in an email to Russell Reitz and filed in a court proceeding, that Philidor had a practice of using an identifier (such as an NPI, NCPDP, or NABP number) belonging to another entity to bill payers for prescriptions it filled? Did you inquire about this in your diligence process as part of the option to acquire equity in Philidor? If not, why not? Was any officer, employee, agent or contractor of Valeant involved in the acquisition of R&O Pharmacy from Russell Reitz by Isolani LLC? To your knowledge, as you consolidate its results, when was the last inventory audit at Philidor or its affiliate pharmacies? To your knowledge, as you consolidate its results, has a payer ever ceased accepting prescriptions from Philidor or so threatened? If so, who and when? Did you investigate Norma Provencio’s co-investment in Recom/Signalife alongside Mitchell J. Stein before renewing her position on the Audit Committee? If not, why not? According to online sources, several employees at Philidor Rx Services formerly worked at Unitek, a Blue Bell, PA, company that was alleged to have experienced a fraud. Before they were hired, did you determine that these employees were not in any way involved in the alleged fraud? Are these employees involved in any accounting function at Philidor? You failed to inform shareholders of the nature or purpose of KGA Fulfillment Services Inc., the entity that holds secured interests over the owners of Philidor. There are a few other such entities about which you have mentioned little. For instance, you registered many Delaware entities, some on roughly the same day in 2012, by the names of Audrey Enterprise LLC, Emma Z LP, Erin S LP, Katie Z LP, Kika LP, Stephanie LP, and Tori LP. For what purpose were these entities established? What is the nature of these partnerships and what assets do they hold? Who besides Valeant has or may potentially receive an economic benefit from these entities? Is Valeant the sole member or limited partner? Prior to the lawsuit in California Central District Court, had you or your employees had any direct communication with officers or employees of R&O Pharmacy? Why did Robert Chai-Onn identify $69 million at R&O as owed to Valeant? Is any money owed to Valeant by R&O additional to monies owed to Philidor - or is Philidor just an arm of Valeant. Have you or any of your employees had direct communication with officers or employees of Brighton Way Pharmacy (d/b/a West Wilshire Pharmacy), Safe Rx Pharmacy, or RAAS Pharmacy (d/b/a Orbit Pharmacy)? If so, when and on what topic? Are the payers Philidor invoices for prescriptions filled aware that Valeant has the option to acquire an equity stake in Philidor? Are they aware that, as you stated, you bear the reimbursement risk on prescriptions filled by Philidor and presumably by these related pharmacies. Several of your competitors have indicated that they have arms-length relationships with their specialty pharmacy channel, and that they do not own any equity or equity-like stake in such pharmacies. Yet you own an option to acquire Philidor, and when I called them, a Philidor representative said they deal almost entirely in Valeant products. Why do you believe your competitors not chosen to replicate your arrangements with Philidor (and its affiliates) with their own semi-captive specialty pharmacies? Has your accounting treatment of Philidor on your own financial statements changed? If so, how and when? If not, do you believe the acquisition of an option to acquire the equity of Philidor require a restatement of any prior year’s filing before the Securities and Exchange Commission? Why or why not? By quarter, what was the total amount of your revenue (gross and net) for products that have been dispensed by Philidor? By quarter, how much inventory have you had on your balance sheet on consignment with or related to Philidor? Is that inventory held at Valeant or at a distributor? By quarter, what was the total amount of receivables from payers generated from prescriptions filled by Philidor (and its affiliates)? By quarter, what was the total amount of your provision for potentially uncollectible receivables from payers generated from prescriptions filled by Philidor (and its affiliates)? How did your relationship with Philidor develop? Who brought them to your attention? Were any Valeant or Medicis employees or agents, current or former, whether full or part-time, involved in launching Philidor? How many days worth of R&O's revenue does the $69M you sought to recover represent? How many square feet is R&O pharmacy? How does a small pharmacy generate that substantial an amount of business? If Philidor holds an option to acquire R&O or other pharmacies, are those pharmacies' results consolidated on your financial statements as well? Are Philidor owners, executives, or employees eligible to receive any form of monetary incentive from Valeant? Have any such incentives been delivered? If so, in what amounts? What are the criteria for receiving such compensation? Have such amounts been disclosed to the Board? Mr. Pearson, have you ever met with or communicated with Philidor executives or employees? If so, how often? For what purpose? In addition to Robert Chai-Onn, which other members of your executive team were aware of the Valeant's relationship with Philidor, R&O, and its other possibly-affiliated pharmacies, such as West Wilshire, Safe Rx, and Orbit Pharmacy? Which executive at Valeant has responsibility for the relationship with Philidor? Which executive has oversight and profit-and-loss responsibility for Philidor's operations? What direction have you given your employees, contractors or agents with regard to discussions of the existence of Philidor and its relationship with Valeant, if any? Why did you decide to purchase an option to acquire Philidor? What did you pay for that option? When did you purchase it, and when does the option expire? Before the most recent disclosures, was the Board of Directors aware of your commercial and financial relationship with Philidor, its owners, and its affiliate pharmacies? Were these relationships discussed by and/or approved by the Board of Directors, the Audit Committee, and your external auditors? Did the Board of Directors approve the acquisition of an option to acquire Philidor? If so, when? What due diligence did you perform on Philidor, and what was the investment case presented to the Board? Are the insurance companies whom you/Philidor invoice, and from whom you bear reimbursement risk, aware that patients have been offered co-pay coupons, waivers, and/or charity assistance for the co-pay portion of the claims submitted? Are they aware of your relationship with Philidor? What information did you provide to them about this relationship? When? To your knowledge, have they audited Philidor, its operations, or its financial controls? To your knowledge, did they inspect Philidor to determine whether it maintains effective internal controls? Were there any disagreements with PWC over how your relationship with Philidor should be disclosed in your filings before the Securities and Exchange Commission? What portion of the operations of Philidor and its affiliates were included in the audit scope on which you and PWC agreed for your 2014 Annual Report? What evidence did you provide to your auditors to convince them that Philidor Rx Services constitutes a variable interest entity that meets the tests for consolidation on your financial statements? Did you have any discussions with your auditor regarding the need, if any, to disclose your relationship with Philidor and its affiliates? Which products were fulfilled through Philidor (and its possible affiliates), and what has been the rate of growth in prescription volume and revenue for those products? You have stated that Valeant takes reimbursement risk for products fulfilled by Philidor. Does this extend to Philidor's affiliates as well? So if an insurance company in California declines to cover a prescription shipped by R&O or West Wilshire, who is out the money for that prescription? Have you established a reserve for prescriptions dispensed by Philidor for which the payer refuses to pay? If so, what is the present level of that reserve and how has it changed over time? Is the inventory held at R&O and West Wilshire (and other Philidor affiliates) consolidated on your balance sheet? Why did you purchase an "option to acquire" Philidor rather than the equity itself? At any point in your internal discussions of such a transaction did anyone, whether an employee or agent of Valeant or Philidor, indicate that pursuing a transaction in this form would perhaps avoid the need to file updated pharmacy registration forms in any state in which Philidor or its affiliates operate? How many of your former employees, contractors or agents work at Philidor? What are their names and titles and what is the nature of their responsibilities? What was Valeant's role in establishing Philidor or its affiliates, if any? What communications, if any, has Valeant had with the SEC’s Division of Enforcement, the US Attorney/DOJ, or Canadian regulators, regarding any matter, in the past 30 days? If such communications exist, what was the purpose and date of those communications? Last week the company said it received a subpoena from the U.S. Attorney's Office for the District of Massachusetts and a subpoena from the U.S. Attorney's Office for the Southern District of New York. Who they were sent to? Have you received any as-yet undisclosed subpoenas, requests for documents, or notices of the commencement of investigations by any other government entity since your prior disclosure? Who owns and has owned Philidor? Do you fill prescriptions for patients living in California? When we phoned, your representative indicated that you ship to "all 50 states." How are you legally able to ship products to states such as California, where you are not licensed? What advice did you obtain, and from whom, that you could legally fill prescriptions and mail them to customers in California, a state in which you are not licensed? Why did you, as the California Pharmacy Board found, omit required information from your filing to become licensed in California? For what products (and from what manufacturers) do you fill prescriptions? What is your annual prescription volume and revenue from each product? Has Philidor Rx Services ever submitted a claim for reimbursement to a payer, whether government or private, using an identifier (such as NPI, NCPDP, or NABP) assigned to R&O Pharmacy, West Wilshire Pharmacy, or any another entity? Your CEO said in an email to Russell Reitz, filed in a court proceeding, that you no longer do so. For how long did you do so? From when to when? How many prescriptions were filled using another entity’s identifier? What was the total amount of revenue from these prescriptions, at wholesale cost and net to you? What advice did you obtain, when, and from whom, that made you comfortable, as your CEO Andy Davenport indicated, that such practices were legal and did not constitute insurance fraud or “health care benefits fraud” as defined in 18 USC § 1347? Did you switch as was alleged for the purposes of reducing the scrutiny of insurance companies on your claims? What portion of your prescription volume and revenue is for products sold by Valeant and its subsidiaries? When did you first form a business relationship with Valeant? What has been the nature of your relationships (financial, legal, commercial) with Valeant over time? What is the nature of that relationship today? Does Valeant provide your owners, officers, or employees with any incentive derived in whole or in part on the volume, type, or price of prescriptions filled? What are your responsibilities for administering Valeant’s prescription access programs? How are you compensated? What happens if an insurance claim for a prescription is denied? Does Valeant compensate you for the wholesale cost of the medication you dispensed? From which wholesalers do you purchase products? Are these products physically located in and dispensed from premises owned by or leased by Philidor? What procedures do you have in place to ensure that patients receiving co-pay waivers do not subsequently submit claims for reimbursement to government-funded programs such as Medicare, Medicaid, TriCare, and the VA? What portion of your customers (and what portion of your revenue) is from customers eligible for such government-funded programs? How much investment capital, working capital, or other funding has Philidor Rx Services LLC received since inception? Who provided that funding? Did Valeant or any of its subsidiaries, current or former, provide any equity, debt or other form of financing to Philidor, now or in the future? It has been reported by several sources that patients have received calls from Philidor to refill prescriptions, whether they requested such a refill or not. Do your employees or automated systems place outbound phone calls to patients for the purpose of or with the effect of generating refill requests? Have your employees offered to waive co-pays on prescription refills generated through outbound phone calls? Were any of these calls made by automated means, commonly known as “robocalls?” If so, did you secure your customers’ prior permission to place such automated calls, as required by the Telephone Consumer Protection Act? If such reminder calls are indeed placed, who is placing them? Are these persons licensed pharmacists, pharmacy technicians, or pharmacy interns? Do any of your employees have quotas or other volume-based incentives, monetary or otherwise, for generating prescription refills from prior patients? Do any of your customers have their prescriptions refilled automatically, whether requested or not? If a prescription that you mail is returned as undeliverable, is the claim cancelled and the payment refunded to the insurance company? Who are the largest customers for your services and how much revenue do you generate from each? How are your employees compensated? Are any employees required to meet quotas in terms of numbers of prescriptions filled (or refilled), claims filed, or reimbursements obtained over a specified period? Are any employees rewarded through incentive compensation for exceeding such targets? What is the nature of your relationship with BQ6 Media and its employees, who are members of Philidor Rx Services? Are any executives, employees, contractors, or agents, whether full or part-time, of Valeant or its subsidiaries, current or former, assigned to, resident in, or commonly present in your offices in Pennsylvania or Arizona? Who? How much time did they spend in your office? What was the nature of their responsibility? How many of your employees, current or former, are or have been employees of Valeant Pharmaceuticals and its subsidiaries, current or former? How many employees do you have? How many hold state licenses as pharmacists, pharmacy technicians, or pharmacy interns? Are any of your employees subject to quotas or other incentives (positive or negative) for number of phone calls or prescriptions filled over any period? If so, what are the terms of the quotas and/or incentives and to whom do they apply? How many prescriptions do you dispense per day? What has that total been, per quarter, for the past three years? Have any payers ceased to cover prescriptions filled by Philidor Rx Services or its affiliates? If so, who, when, and why? Did you solve this by changing the pharmacist identification number to as small pharmacist that you had purchased for the person of diversifying the distributing pharmacy. Have you at any time failed an audit by a payer? If so, who, when, and why? Has any payer ceased to do business with Philidor, including withholding payment for prescriptions filled? Has any payer so threatened? Who, when and why? What portion of your revenues from drugs sold by or produced by Valeant Pharmaceuticals and its subsidiaries? What was the total amount of co-payments collected, by quarter, for the past three years? What was the median, average, and total co-payment amount collected, by drug? Are the operations of any other entity consolidated on the financial statements of Philidor Rx Services LLC? At any point was the work or performance of any current or former employee, whether full- or part-time, or member of Philidor Rx Services subject to direction or review by any other person or entity currently or formerly employed or retained by Valeant Pharmaceuticals and its subsidiaries, current or former? Has Philidor Rx Services LLC or any entity other entity in which it owns an economic interest or exercises operational control received an audit from a PCAOB-registered accounting firm? If so, whom? How often did you meet with executives, employees, or agents of Valeant Pharmaceuticals or its subsidiaries, current or former? Did Valeant’s auditors, PriceWaterhouseCoopers LLP, conduct an audit of your operations and financial results before your operations were consolidated into Valeant’s financial statements? If not, why not? When did Valeant purchase an option to acquire an equity interest from the members of Philidor Rx Services LLC? What did they pay for that option? What were the terms of the agreement? Why did you choose to sell an option rather than your membership interests directly? When your members sold an option to Valeant to acquire your interests, did you update your registration with any state or federal authorities, such as Boards of Pharmacy, the DEA, VA, DOD/TriCare, HHS, or CMS? If not, why not? You stated in your press release that “Philidor does not currently have a direct equity ownership in R&O Pharmacy or the affiliated pharmacies, but does have a contractual right to acquire the pharmacies now or in the future subject to regulatory approval.” As court documents filed by Isolani LLC indicate that it is Isolani LLC that would own 90% of R&O upon consummation of the transaction with Mr. Reitz, how is it that you came to own an option to acquire R&O? Do you believe that an entity that has been denied a license to operate a mail-order pharmacy in California can purchase—either directly or through an option to acquire—a licensed pharmacy in California? What is the nature of your relationship (commercial, legal, financial, operating) with R&O Pharmacy now and over the past three years? What is your role in R&O’s pharmacy operations? Why did you send invoices, as filed with the court, from Philidor to purchase products from Valeant Pharmaceuticals, to the attention of the R&O Pharmacy finance department? Why did you use and then discontinue the use of, as the email from your CEO Andrew Davenport filed with the LA County court by R&O Pharmacy indicates, the various identifiers (NPI, NCPDP, NABP) assigned to R&O Pharmacy? As you are licensed in many states, why did you desire to use such identifiers assigned to R&O Pharmacy? As the acquisition agreement filed with the LA County Court indicates that such identifiers were to be assigned to Isolani LLC as part of the purchase of R&O, how did Philidor Rx Services obtain the right to use such identifiers itself? To your knowledge, have any of your employees—including licensed pharmacists or pharmacy technicians—resigned due to reservations about the conduct they observed and/or in which they were asked to participate? What did you do, if anything, to learn of those concerns and/or ameliorate those of which you were informed? What information did Russell Reitz provide you that made you agree to stop using identifiers such as NPI#, NCPDP# or NABP# belonging to R&O Pharmacy? Are you aware that this document - that you filed in State Court in California contains a putative list of products distributed by R&O but in fact fulfilled by you. Moreover are you aware that the identification numbers in that document correspond to UPS tracking numbers and hence you have provided evidence that product was shipped to areas where you or R&O were not licensed? Are you aware that changing the pharmacist identification number for the purpose of deceiving the payer is wire fraud against a financial institution? Are you aware that the fine is $1 million per instance and the instances are cumulative? What is the nature of your relationship (commercial, legal, financial, operating) with Isolani LLC? What services does Philidor provide, if any, to Isolani LLC? Is Eric Rice an employee or has Eric Rice ever been an employee, contractor or agent of Philidor or its affiliates? If so, what are/were his responsibilities? What are/were his dates of employment, title, and assigned office location? What is the nature of your relationship (commercial, legal, financial, operating) with Lucena Holdings LLC? Are its operations reported on Philidor’s financial statements? How? What is the nature of your relationship (commercial, legal, financial, operating) with Brighton Way Pharmacy (d/b/a West Wilshire Pharmacy) now and over the past three years? Why was such a relationship formed? What was the genesis of such a relationship and what benefits did it provide to you? Are Bright Way Pharmacy’s operations reported on Philidor’s financial statements? How? What is the breakdown of prescriptions filled by Philidor (and its affiliates) by dispensing code? Where no DAW code has been supplied, do pharmacists in your employ (whether full or part-time) offer a generic alternative to the patient when available? Does Philidor report data on the prescriptions it fills to IMS Health or other third-party supply chain reporting services? 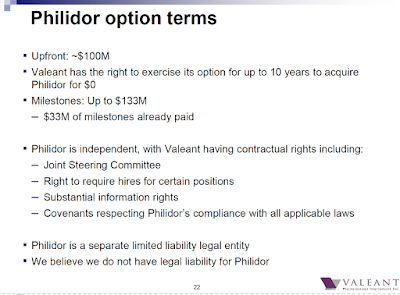 What reports does Philidor provide to Valeant management and on what schedule? Why are all the entities related to Philidor (BQ6, Isolini, Lucena, Philidor itself, KGA) named for chess moves? What other pharmacy relationships does Philidor have that have not yet been disclosed? What is the nature of those relationships? Why did a member of Philidor, Fabien Forrester-Charles, register a second domain name for R&O Pharmacy? Similarly, why were domain names created for West Wilshire Pharmacy, Orbit Pharmacy, Safe Rx Pharmacy, and dandapharmacy.com? What exactly is your relationship with West Wilshire Pharmacy today and over time? Why is Sherri Leon, a pharmacist you employ, listed as the Registered Agent in CA state filings for Brighton Way Pharmacy, the legal name of West Wilshire Pharmacy? Is Philidor Rx Services LLC your full-time employer, as indicated on your LinkedIn profile? If not, who is? Did you form Isolani LLC of your own volition, or were you directed to do so by another party? If so, whom? If not, why did you personally decide to acquire a pharmacy in California? By name and amount, who has ownership of, or the right to acquire ownership of, an economic interest in Isolani LLC? How many employees does Isolani LLC have and what are their names, titles, and dates of employment? Are any of them now, or have any of them been, employees of Philidor Rx Services LLC or Valeant Pharmaceuticals (and its subsidiaries, current or former)? Were you the sole provider of initial start-up capital for Isolani LLC? If not, what other person or entity provided capital? Were Philidor, Valeant, or their subsidiaries (current or former), or employees (current or former) among those who provided capital? Did you personally provide the $350,000 to purchase R&O Pharmacy from Russell Reitz, as outlined in the purchase agreement you filed with the court in your lawsuit against R&O? If not, who did? Did Philidor, Valeant, their subsidiaries, or their employees provide any capital to you personally or to Isolani LLC to facilitate this purchase? As Isolani LLC is entitled to all of the profits and losses of the operations of R&O Pharmacy according to the purchase agreement you filed with the Court, do you personally receive such profits and bear such losses? If not, who does? Are any of the persons who are entitled to receive such profits or bear such losses current or former employees or entities currently or formerly associated with Philidor Rx Services LLC or Valeant Pharmaceuticals in any respect? Have you signed any agreement governing the operations of Isolani LLC or the assignment of its profits and losses to any other entity, including Philidor Rx Services LLC, Valeant Pharmaceuticals, their subsidiaries (current or former), or their employees (current or former)? Who is providing the funds to pay attorneys and other expenses in your lawsuit against R&O Pharmacy in California? Are any of these funds provided by Philidor Rx Services LLC, Valeant Pharmaceuticals, their subsidiaries, or their employees? Why was Isolani LLC formed to purchase a 90% stake in R&O Pharmacy rather than having Philidor Rx Services LLC or Valeant (or its subsidiaries) purchase it directly? Why did you request, as part of the purchase agreement you filed with the LA County Court in your lawsuit against R&O Pharmacy, that Russell Reitz transfer, at your request, his NABP/NCPDP and NPI numbers into Isolani LLC’s name? In using such identifiers, do you believe that Isolani LLC, itself not a registered pharmacy in any state or with the federal government, be in compliance with pharmacy registration requirements? Are you based in Pennsylvania, from whence you direct the operations of Isolani LLC? If so, why are you not registered as a foreign corporation in Pennsylvania? Why, according to emails filed with the court, did a controller for Philidor Rx Services LLC undertake to assist R&O Pharmacy with its compliance audits by a payer customer, when the 90% owner of R&O is Isolani LLC? Philidor Rx Services indicated in a press release that they own an option to acquire R&O Pharmacy, of which Isolani LLC owns 90%. What are the terms of this option? When did Philidor acquire this option and for what compensation? Did you receive any proceeds from this sale personally? If not, as you were the sole member of Isolani LLC, why not? Some Questions for Brighton Way Pharmacy, Inc., d/b/a West Wilshire Pharmacy? Have you mailed any prescriptions to patients outside of California, the only state where you are licensed? What is the nature of your relationship (commercial, legal, financial, operational) with Philidor Rx Services at present and historically? To your knowledge, has anyone not a direct employee of Brighton Way Pharmacy caused any identifier assigned to Brighton Way Pharmacy (such as an NPI, NCPDP, or NABP number) to invoice a payer for a prescription or other services? What is the nature of your relationship with Lucena Holdings, a Delaware LLC? Have any employees, contractors or agents of Valeant or its subsidiaries, current or former, been physically present on your premises in Los Angeles? For what purpose? Have any employees, contractors or agents of Philidor Rx Services or its subsidiaries, current or former, been physically present on your premises in Los Angeles? For what purpose? How many persons do you employ? How many are licensed pharmacists, pharmacy technicians, or pharmacy interns? How long has Aisan Zagarian been licensed as a pharmacist in California? Is West Wilshire Pharmacy her first employer as a registered pharmacist? How many prescriptions has she filled in the time she's been employed at West Wilshire? For what products do you fulfill prescriptions? Do you fill prescriptions for any products not manufactured or marketed by Valeant Pharmaceuticals or its subsidiaries, current or former? You know it's always the guy named “Fab” who gets blamed for the whole mess, right?